I consider myself a foodie. But my definition of “foodie” isn’t just about hedonism. It’s about using a country’s cuisine to unlock a greater understanding of its culture and its history. If you can zoom out to the bird’s-eye view, it’s clear that food is culture, and so much of a nation’s identity is wrapped up in its culinary reality. I make a point to take food tours all over Europe as a way to indulge my curiosity about how food influences culture…and to indulge my palate. And the best one I’ve ever experienced was in an unlikely place: the Polish capital, Warsaw — which has, over the last few years, quietly transformed itself into Europe’s budget foodie mecca. In Warsaw, I spent a fascinating (and delicious) half-day with Eat Polska, in the company of an excellent guide named Michaś. Now, Poland is one of my favorite countries. My grandfather was Polish, I’ve written guidebooks about Poland, and I’ve traveled to Poland more than 20 times for both work and pleasure. I thought I had a pretty good handle on this place. 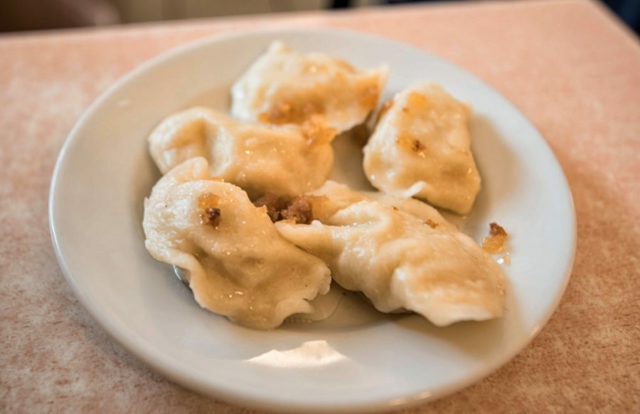 But Michaś opened my eyes to how the country’s epic history, hardships, victories, and persistent personality flavor every bite of every dish. Whether you’re going to the land of borscht, pierogi, and vodka — or a place better known for pasta or foie gras — a great guide can turn a food tour into a food tour de force. After we met on a busy urban street corner, Michaś brought me to a traditional restaurant to build a foundation for the rest of the tour. 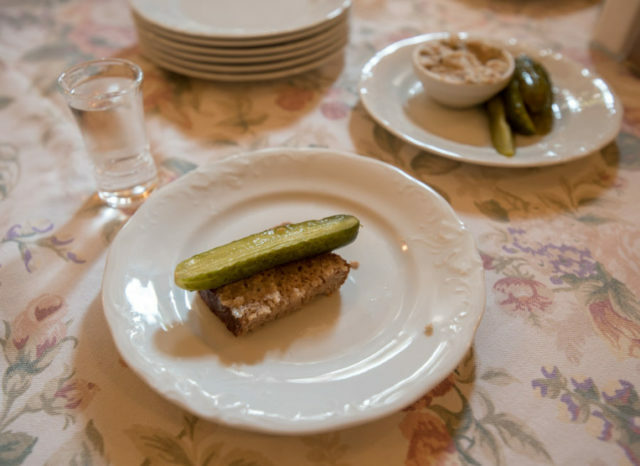 We sat down to a table laden with bread smothered in lard, pickles, a bowl of bright-red borscht, and a shot of vodka. Just as I was about to dig in, he said, “Wait! Before you eat, look at this table. Only two items here are not fermented. Which ones?” After several wrong guesses, he gave me the answer: the salt and the vodka. 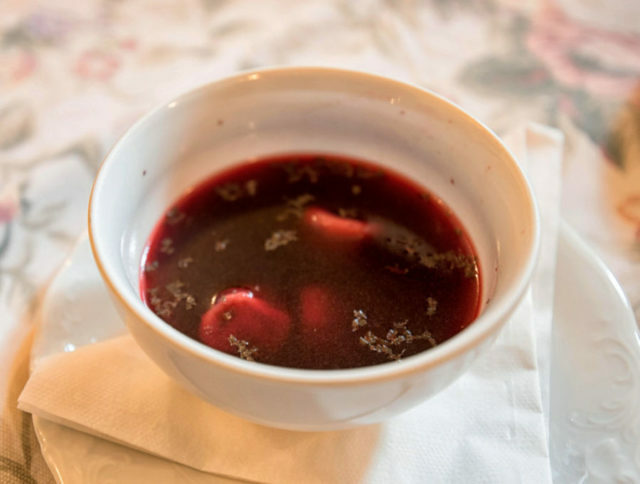 Even the beets are fermented (for days, weeks, or even months) before they go into the borscht. When it was time for the vodka, Michaś explained the procedure: First, you eat a bite of bread with lard. Then the shot. And finally, the pickle. This routine is rooted in science more than superstition: The fat in the lard coats the digestive tract; the acidity and mineral salt of the pickle replace those killed by the alcohol; and both bites mask the burn of the vodka. Strolling through a park to our next stop, we talked about the importance of thick, hearty soups in a peasant culture. These allow poor people to nourish their families, even if they lack protein. Most Polish soups are thickened with flour, cream, or chunks of vegetables — replacing the substantial-ness that would normally be provided by meat. “You could say that Poles were vegetarians — not by choice, but by circumstance,” Michaś said. In olden times, meat was a major status symbol in Poland. That’s why Poles still sprinkle little fried chunks of bacon fat on just about every dish. Rather than hide it inside the dish, they perch their paltry protein on top for all to see. Our next stop was a trendy foodie restaurant that takes some of the traditional recipes we’d just tasted, and modernizes them. 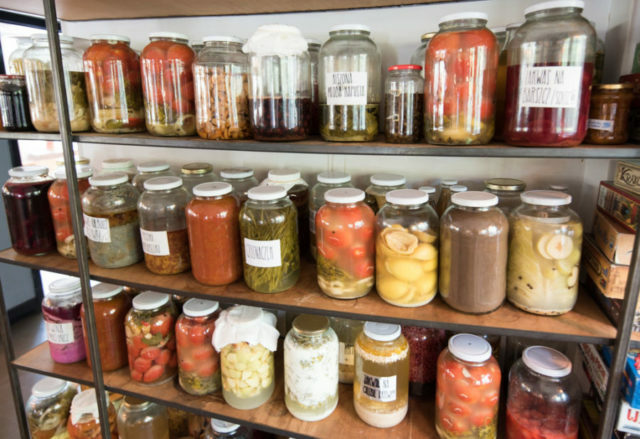 Speaking of fermentation, they have an entire wall with jars of fermented produce, which looks a demented chef’s chemistry experiment. The server brought out a plate of individually labeled sausages and cheeses. Now, there’s “Polish sausage”…and then there’s Polish sausage. And this sausage was delicious. Michaś gave me a guided tour through the subtle flavor differences of each one, as if sampling wines: Lightly smoked. Garlic. Marjoram. Peppercorns. Juniper. He explained why Poles smoke their ham hocks, rather than air-curing them, as in Mediterranean lands: It’s simply too wet here. And he explained how the best sausage actually came about during the lean communist times. Back then, people had to raise their own livestock to supplement the paltry, poor-quality, government-rationed foodstuffs. (Most of the official production of Polish pork was exported. “The only things you’d find in a grocery store,” Michaś half-joked, “was shelves and vinegar. And sometimes mustard.”) Raising your own pig became a cottage industry…“farm to table” in the most literal sense. In the spirit of “let them eat cake,” Michaś pointed out what really brought down the USSR: For most of the front-line protesters here in Poland, it wasn’t about political philosophy, or economic -isms, or craving democracy and freedom. At the end of the day, it was about feeding your family. If the communist system had succeeded in providing for all of its people, it may well still be the law of the land. Since the end of communism, people can buy sausage in supermarkets rather than raising and butchering their own pigs. And so, traditional, organic, locally rooted farming has given way to modernized factory farms. These days, pigs are grown as big as possible, and pork is pumped with brine before it hits the supermarket. Poles may not be nostalgic for much from communism — but they do miss the delicious kielbasa from that age. Our next stop was Bibenda, a hip bar with clever fusion food. The chefs pride themselves on deconstructing Polish classics, then reinventing them by pulling in elements from comparable dishes in other cultures. 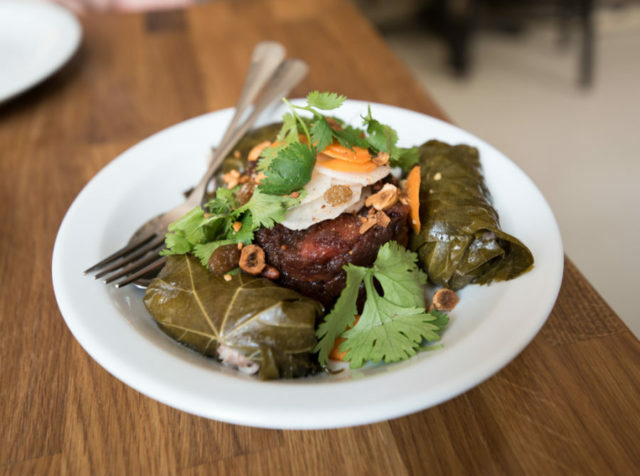 Digging into our dish — a reinvention of the Polish cabbage roll (gołąbki), but wrapped in a grape leaf — Michaś pointed out the subtle and surprising Turkish connection to Polish cuisine. In the 17th century, when much of Eastern Europe feared the Ottomans, Poland maintained relatively good diplomatic relations with the sultan. (Even during the Partitions — when the state of Poland was divided among its neighbors, formally ceasing to exist — the Ottomans continued to recognize the Polish ambassador.) And to this day, Polish cooking retains a few surprising echoes of that history: Cinnamon. Raisins. Apricots. And what is the classic Polish cabbage roll, but a supersized version of the Turkish dolma (stuffed grape leaves) with a more locally sourced wrapper? One of the themes in Polish history is that this vast, flat land — smack in between powerful neighbors Germany and Russia — has always been a crossroads of mighty civilizations. And you can taste that cultural mingling in the food. For example, Polish cooking uses more celery and cauliflower than its surrounding nations. That’s because, in the 16th century, King Sigismund the Old had a young Italian bride, who imported this Mediterranean produce to her new homeland. And what about that quintessential Polish staple, pierogi? They’re so similar to Asian dumplings. (Think about it: The main difference between gyoza and pierogi is the seasoning.) Maybe that’s because pierogi arrived in Poland in the 13th century — exactly when the Tatars rode from Asia, all the way across the steppes of Russia, to ransack the Polish countryside. Many Poles still bake their own sourdough bread, using bacteria cultures more than a century old. In this modern age, there are online message boards to arrange for someone to “feed” your sourdough starter when you’re on vacation. I asked Michaś about my favorite polish dish, bigos. Sometimes translated as “hunters’ stew,” this is a thick, rich, and incredibly flavorful mix of sauerkraut, mushrooms, sausage, and any kind of meat available. “It’s like American chili,” Michaś said. “There’s no one recipe; everyone makes it their own way. Even the ingredients can change — whatever protein you have available, you can put in the pot.” Also like chili, bigos tastes better the next day…or the day after that. Traditionally, you’d make a pot of bigos to use up any leftovers after your Christmas feast. After a long simmer, you’d put the pot outside to freeze overnight, then bring it in again to thaw. Sometimes you’d do this for many days — freeze, thaw, freeze, thaw — each time rupturing the cells of the plant matter inside, breaking down and marrying all the flavors. By the time it’s done, it’s incredibly delicious. I heartily concur. After a few hours with Michaś in Warsaw, now when I bite into a Polish dish, I can practically taste Tatars and Turks shaping Poland; I can taste hardworking peasants cultivating a barren countryside; and I can taste a deep, soulful national pride that goes beyond salt and pepper. For more tips on what makes a great food tour, check out my blog post on the topic. And if you love Polish food (like I do), join me on a visit to my favorite milk bar. 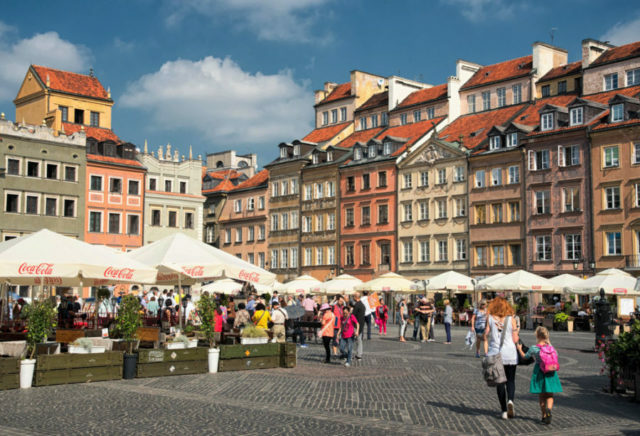 And, of course, the best food tours we discover — in Poland, or anywhere in Europe — go straight into our Rick Steves guidebook series. I really enjoyed this post, Cameron… you have an amazing writing style… I felt like I was on the tour right with you. My wife and I are a few years away from being empty nesters and we are very much looking forward to following in your footsteps. Please keep sharing! The Eat Polska food/vodka tour in Warsaw with Michas was by far the best food tour I’ve been on! I was in Poland this past December, and I learned about Eat Polska’s food tours through the Rivk Steve’s Guidebook for Poland. Just happened to end up with Michas as our guide, and what a fantastic tour he gave! His knowledge of Polish history was wonderfully woven into the education around the foods and vodka we tried. And the different restaurants and bars that we visited gave us a mini tour of Warsaw! Michas was delightful, fun, engaging, and knowledgeable- all the best qualities of a great tour guide. And therefore, a wonderful and memorable tour! Fantastic writing. Thoroughly enjoyed reading your post. Even though I was born and raised in Warsaw, I’ve learned few things from you. I grew up in Poland and lived there up to the mid 90’s. I just hate when Polish people tell you the stories of horrible times that there was nothing to eat, empty shelves with vinegar and stories rationed food. Yes, there were rationed foods, like meat and sugar however it was few kg (x2 if you think in lb) of meat per person. The shelves were mostly empty only for a brief period of time… during martial law period but you could still get food staples. My sister had small wedding reception just after martial law was announced…the restaurant event was cancelled due to fact that unless you had permission to be out of your home after dark, you had to be home after dark. But believe me, about 20 people were fed and had drinks, coffee and cake at our 2 room apartment. Some of them slept on the floor, or at the neighbors afterword. Yes, often there were lines but no one went hungry and homeless. Unfortunately, there are many, many more hungry and homeless people nowadays. 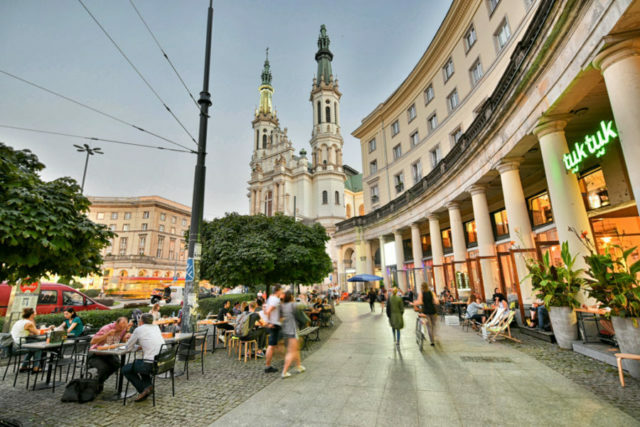 I am not saying this to put anyone off from traveling to Poland, it is nice, safe and good value destination to visit if you travel in Europe. I just wish that you enjoy your time without the untrue stories that feels like somehow you are suppose to be more grateful that you did not visit 30 years ago. Every country was different 30, 40, or any years ago. Good observations. Indeed, I never witnessed homelessness or severe poverty during communist times. Staples were available, though meager at times and you had a chance to chat while you were standing in line for bread for an hour or two. Now, the way that I cook mirrors my upbringing and passion for simple yet cleverly assembled Polish food. Enjoyed reading this and it made me hungry to delve more deeply into Polish cuisine! On our Germany trip this last August, we stayed in Gorlitz on the Polish border and really enjoyed walking across the bridge into Poland and having a great Polish meal at an outdoor cafe along the river. The helpful waitress helped us order some characteristic dishes. Especially memorable were the soups we tried and a simple dessert that featured sliced, cooked apples drizzled with a honey sauce, dried fruits, etc. Gorlitz/Zgorzelec is kind of Poland-Lite but was enough to make me want to go back for more! I really enjoyed your article, Cameron. 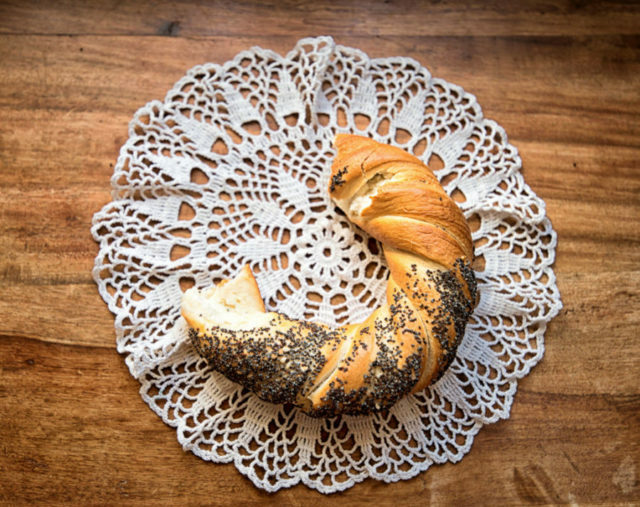 Traveling and eating through Poland was such a delightful experience for me. Fortunately I grew up eating Polish food at home because my grandmother was a fabulous cook. She was and is my cooking muse. Some of my great food memories of Poland are eating a wonderful Polish style cheesecake at a roadside stop and simple but wonderful ham and cheese sandwiches on a long French bun. Another memory involved a meal in Krakow, where the waitress set down a loaf of bread, a knife and what appeared to be butter but wasn’t. Everyone in my group lovingly smeared this on their bread and ate it before I told them it was smalec. A little lard in your life won’t kill you! Pork is king in Poland and Poles work magic with pork, cabbage and beets. I am overdue for a return visit. Wow, this ‘Food Tour’ sounds great! I have never been on an actual one, but my friends from Warsaw have organized something like that for me, during my last visit in Warsaw few months ago and I loved it. They took me to their favorite breakfast spot, restaurant for a lunch and in the evening we went to their favorite bar. The place that I enjoyed the most was a restaurant, where we had a real Polish dinner. It was called the Akademia, and the food there was so delicious! We had to wait for a while, because the place was full, but it was worth it, because the dinner was excellent.